Frittata is an Italian dish, in fact it's an omelette where the eggs are mixed with different ingredients. 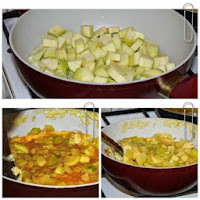 For example the zucchini omelette - frittata con zucchini, in Italian - contains 5 eggs, 2 medium size zucchini, onion to taste, one or two green peppers, salt, white pepper, parmiggiano for the topping, olive oil. Beat the eggs with a fork, then add salt and pepper and leave aside. Wash thoroughly the zucchini and then cut them into very slim slices, after peeling them. You may also chop them if you like. Fry them in oil at medium heat, into a non-adherent pan. Then add the onion, chopped a la julien, the green pepper chopped into slices and after 3-4 minutes add the beaten egg. Don't mix the omelette, just lower the heat and put a lid on the pan. In several minutes it should be ready. Grate some parmiggiano (cheese) on the top, turn the heat off and finally transfer the frittata con zucchini on a plate. Serve hot as well as cold.